Commercial breaks, radio spots, product placements, billboards, pop-up ads-we sometimes take for granted how much advertising surrounds us in our daily lives. We may find ads funny, odd, or even disturbing, but we rarely stop to consider their deeper meaning or function within society. What, exactly, does advertising do? How and why do ads influence us? How does the advertising industry influence our media? 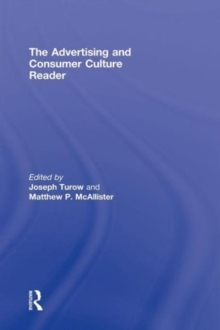 These are just a few of the many important questions addressed in The Advertising and Consumer Culture Reader-an incisive, provocative collection that assembles twenty-seven of the most important scholarly writings on advertising and consumer culture to date. The classic and contemporary essays gathered here explore the past, present, and future of advertising-from the early days of print to the World Wide Web and beyond. These selections offer historical, sociological, critical, cultural, and political-economic lenses to explore a wide range of topics-from consumer activism to globalization to the role of ads in the political process. Together, these key readings chart the past, present, and future of advertising, while also examining the effects of advertising and consumer culture upon individuals, society, cultures, and the world at large. Designed for use in courses, the collection begins with a general introduction that orients students to thinking critically about advertising and consumer culture. Section and chapter introductions offer valuable historical and critical context, while review questions after each reading will spark classroom debates and challenge students' understanding of key concepts.